I consider myself a harlequin. To be clear from the start, we’re talking Commedia del Arte here, not Batman. Though Harley Quinn is pretty hot. Needless to say, I am not a fan. If you want to get any harlequinizing done, you need to look SHARP. Listen to this song. Now. I'll wait. These fabulous tights, worn by the fabulous Gabby Young in the fabulous “Ask You a Question” video which is fabulous. So the inspiration was in place, and rather unusually, it stayed with me right through the making process of the trousers, and then the rest of the outfit, even when I was delayed while waiting for fabric. That’s some solid inspiration, folks. 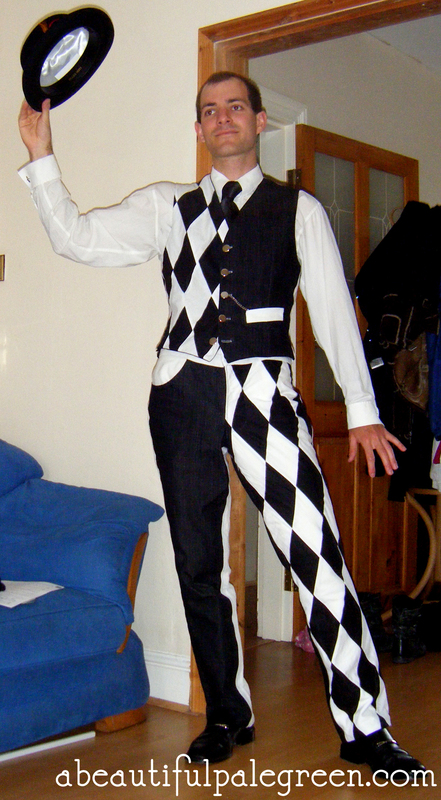 Now, as previously discussed, the traditional harlequin wears a silly baggy suit which would sometimes even have bells on. Bells! How are you supposed to get any harlequinizing done if people can hear you coming? I am SO happy with how it turned out. The photo doesn’t do it justice, since it’s my little camera on self timer in my living room, but I’ll get some proper photos taken soon! UPDATE: You can see the nicer photos here! This entry was posted on Monday, August 27th, 2012 at 10:21 am	and is filed under circus swing, costume, harlequins. You can follow any responses to this entry through the RSS 2.0 feed. You can leave a response, or trackback from your own site.